I’ve never been one for massages. In fact, the very idea of them makes me uncomfortable. How people can find total relaxation while a complete stranger rubs, grinds, and pulverizes your body with their knuckles (or worse, elbows) is beyond me. Nevertheless, due to some troublesome neck problems I’ve been having, I recently found myself face down on a massage table for a full 60 min session. I was willing to give it a try. My friends always went on and on about how massages are so relaxing, they fell asleep right there on the table. Do you think I slept for even a second during this hour? I ended up having one of the most deeply personal conversations I’ve had in recent memory. And with a complete stranger to boot. She told me all about her life history, which naturally gravitated to what was most troubling her at the moment. She was currently in what she felt was the most meaningful relationships she’s ever had, but was still finding it difficult to find fulfillment and contentment. Now in her mid-30’s, there were just so many things she still wants to accomplish. She wanted to be with someone who still allowed her to be independent on her own terms. And that’s when she said it. The phrase that has seemingly appeared out of nowhere. One that has inspired an entire movement of people who are yearning for more contentment in an increasingly dissatisfying world. There is a dangerous and pervasive attitude permeating every aspect of our society. The idea of “self love” has been warped and distorted. While it is absolutely important to love yourself to a certain degree, many have taken this way too far, neglecting the needs of others and isolating themselves in the process. Caring for yourself, respecting yourself, and having a sense of self-worth is very important. But should it be our primary focus? Doing so focuses our attention inward, and fosters a selfish attitude. In Adam Grant’s book, Give and Take, he discusses a test that he and his colleague tried in a nearby hospital. He wanted to see if a subtle shift in perspective could motivate people to do the right thing. Over the next two weeks, a member of each hospital unit covertly counted the number of times that medical professionals washed their hands before and after each patient contact, while an independent team measured the amount of soap and gel used from each dispenser. The sign on the left had no effect whatsoever. The sign on the right made a significant difference. Merely mentioning patients instead of you led medical professionals to wash their hands 10% more often and use 45% more soap and gel. But I think there’s more to it than that. I believe humans are inherently good. I believe that we are a product of our own environment, and that this world desensitizes us to the needs of others and slowly grinds our kindness and empathy into a pulp. If we let it, that is. This subtle adjustment in messaging helped these doctors and nurses reignite that empathy inside them. It brought to mind that this simple act of personal hygiene wasn’t solely personal. It had a direct and measurable consequence on others. Sadly, with the advent of misguided ideologies like “self love”, it seems like this type of thinking is becoming less and less common. We can find evidence of this all around us. The world has never felt more divisive. It seems like the more people preach about displaying unity and inclusiveness, the more walls continue to be built up. Everyone is “talking without speaking and hearing without listening”. 1) Focus your attention on one person. On one simple act of kindness. It can be a close friend, a family member in need, or a stranger in the grocery store checkout line. Just do something nice for someone. It will make their day, trust me. 2) Identify and eliminate sources of stress, tension and sadness. For me, I found Netflix (and TV in general) to be a big source of negativity, so I got rid of it. 3) Make time to do nothing. Get into a habit of daily meditation. Many people claim that happiness comes from putting yourself first. I believe there is far more evidence that proves the exact opposite. 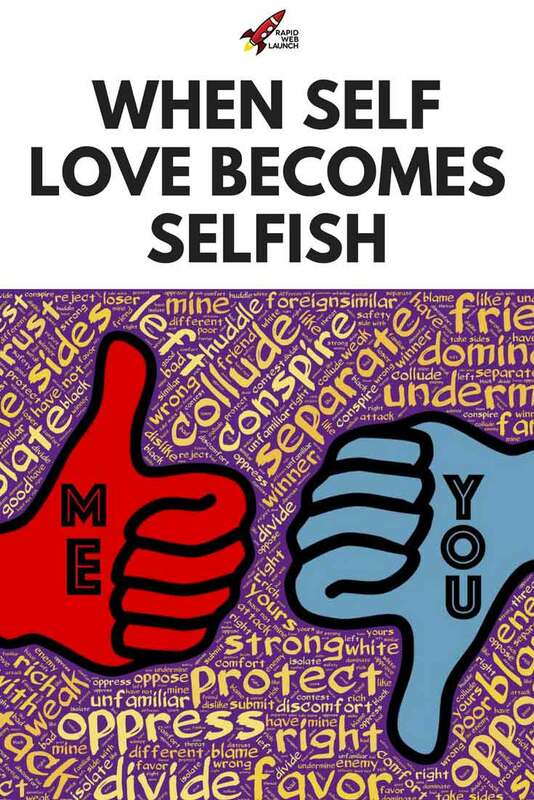 Selfishness is the practice of putting your own needs above all others, while reasonable self-love is making sure your own needs aren’t always considered last. The best part about putting others’ needs ahead of your own is that you will directly benefit as well. When you see the positive effect your actions can have on others, you will no doubt build your self-worth and confidence, and you will live with a greater sense of purpose.